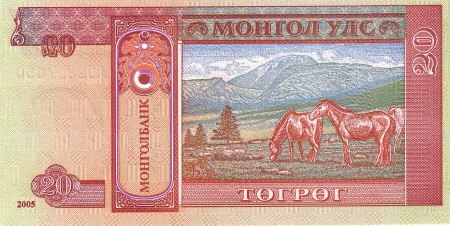 The Mongolia currency is the Togrog (also spelled 'Tughrik', there are different translations from Mongolian to the latin alphabet). The currency code is MNT. One US dollar is currently worth about 1,200 Togrogs. Due to the mining boom and increased foreign investment, the Togrog has been steadily appreciating against all the major currencies over the past few years, and was one of the world's best-performing currencies in 2009. 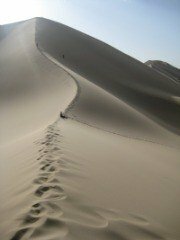 That's good news for most Mongolians, but bad news for foreign visitors. Togrogs come in notes of 10 to 20,000. There are T1 and T2 notes as well, but they're no longer worth the paper they're printed on. The T20,000 note is a relatively new addition, but even that is worth only US$16. 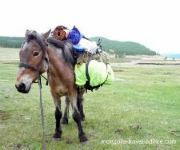 As a visitor, withdrawing Mongolia money from an ATM often means you will walk away carrying around a large wad of cash!